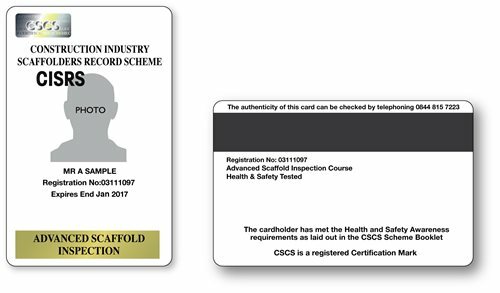 Following the recent news that the CISRS scheme has breached the 50,000 cardholders mark, the first scaffolder to be issued with a CISRS card back in 1979 has been in touch – Allan Craigen, Director of NASC member company Heywood Scaffolding Services in Lancashire. 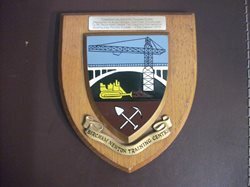 Allan, who worked for a small building company in the North West at the time, was amongst the first cohort of trainees to attend National Construction College East (Bircham Newton) under the new CISRS rules introduced at the end of the 1970s. 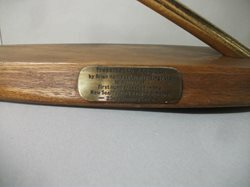 Although a scaffolder record scheme has existed since the mid 1960s, formal training attendance had been on a voluntary basis, with the vast majority of cardholders qualifying through industry accreditation (‘grandfather rights’) – learning their trade on the job with their employer, then applying for a card when they felt they had the required amount of experience and skill. 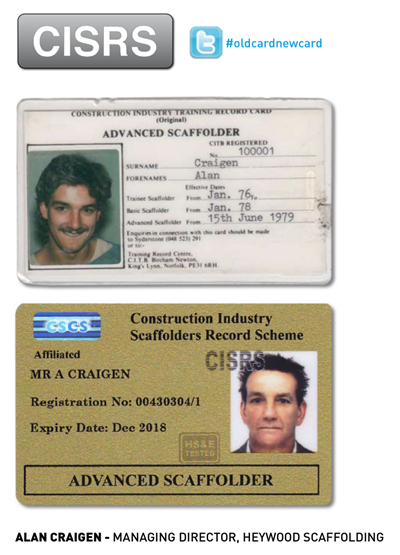 The changes to the CISRS scheme were the beginning of the end for ‘grandfather rights’ within the scaffolding industry, and this route was withdrawn completely in the 1980s, with a requirement for anyone coming into the industry to complete Part 1, Part 2 training etc prior to obtaining their scaffolder card. Allan completed his Part 1, Part 2 and Advanced training at Bircham Newton under what was known as the CECOL course at the time, which was a forerunner to the current scaffolding apprenticeship route. 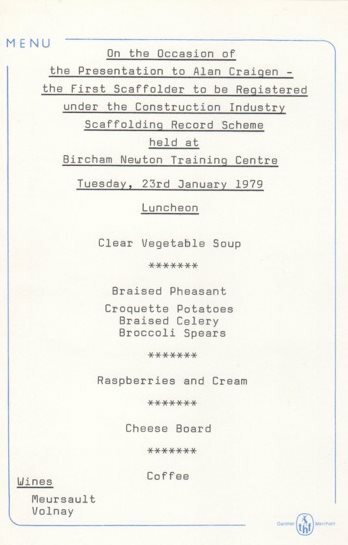 The National Construction College at Bircham Newton was the first training centre in the UK to offer CISRS scaffolding training, and it remains one of the largest construction colleges in Europe to this day. 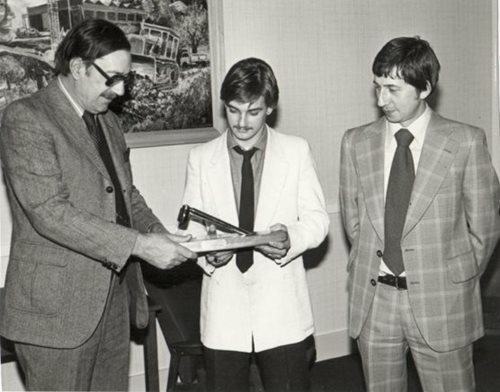 Upon successful completion of his training, Allan was issued with his new CISRS card, which had the registration number 100001, a plaque from the college, and a golden scaffold spanner by his employer (unfortunately for Allan this was only sprayed gold, not made of gold!) to commemorate being the first scaffolder to complete the new style course. As a long time NASC (National Access and Scaffolding Confederation) member, Allan is fully aware of the importance of the CISRS scheme and understands the benefits of employing a fully qualified workforce. He remains thankful to his employer at the time for supporting him through his training when a lot of other companies had yet to commit to it. For further details about CISRS card courses, training changes following the introduction of TG20:13, information and dates on courses available, a list of approved training providers, or to find out more about CISRS, please visit www.cisrs.org.uk or email enquiries@cisrs.org.uk. The New Year has brought with it an improved, fully revised and standardised CISRS Part 1 training package – which has recently been issued to all CISRS approved training providers. Course standardisation is the culmination of around nine months work by a working party made up of representatives of the National Construction College (NCC), private training providers (Simian Skills and Safety & Access Ltd), former NASC President Bob Whincap, and the CISRS Scheme Manager, Dave Mosley, with the support of other instructors from participating CISRS accredited training centres. The CISRS scheme has been around for over 40 years and is the recognised qualification for all those working within the scaffolding sector. The core scheme programmes Part 1, 2 and Advanced have undergone several transformations over the years – like the withdrawal of Industry Accreditation (“grandfather rights”) and the introduction of NVQ, Health and Safety testing and mandatory skills tests etc. These improvements to the CISRS scheme – coupled with changes that have been enforced by new Health and Safety guidance or innovation in equipment and work practices – has meant that CISRS has had to evolve over the years in order to stay relevant. CISRS has always provided accredited centres with scheme criteria, relating to practical facilities, instructor qualifications, and the delivery of their courses (e.g. minimum course requirements, course content, requirement for suitable drawings, risk assessments, method statements etc). When the scheme was in its infancy, with only National Construction Colleges (CITB) delivering approved courses, it was a relatively simple task to ensure that course delivery and the information imparted to delegates remained standardised across all the centres. However, as there are now 20 different providers across the UK offering CISRS core scheme training this has become much more difficult to manage – as instructors and centres look to introduce their own interpretation of the delivery requirement for CISRS courses, based upon industry experience. The CISRS scheme is held in high esteem within the industry. But following the introduction of NASC TG20:13 tube and fitting best practice guidance in February 2014, a call from industry to include mobile aluminium tower training and scaffold inspection modules within the courses, and unanimous support from those attending the inaugural CISRS Instructor Conference in March 2014, CISRS agreed it was time for a radical review which would result in the production of a standardised training package for use by all centres. The package includes updated paperwork for both the delegate and provider and includes the following: Course programme, session plans, example risk assessment and method statements, practical exercise marking papers, theory test papers, delegate feedback forms, and delegate declaration forms, plus drawings for practical structures, PowerPoints for each session, relevant industry videos, TG20:13 etc. And the electronic files are split into separate days (1-10) with all the required information for each day of the programme contained within. 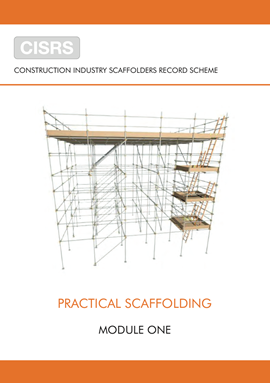 A brand new full colour, 24-page Practical Scaffolding Module One document has been produced, which will include all the necessary information on scaffolding components, and the basic requirements needed to safely erect and dismantle scaffold structures within the Part 1 syllabus. A copy of this document will be given to each trainee within their trainee folder, which also contains relevant NASC Health & Safety and Technical guidance. Providers have been issued with the training package a few weeks prior to the course going live on Monday 2nd February, in order to have a chance to familiarise themselves with it and spot any typos, errors etc. The feedback to date has been positive – although it has not been without some degree of controversy, as the extended programme means that both delegates and Instructors will now be required to stay at their centres later on Friday afternoons when completing CISRS courses. The CISRS working party are looking to start work on Part 2 next month. The introduction of the new courses will be the major topic for discussion at this year’s CISRS Instructor conference which will be held at NCC East in March 2015. For further details about CISRS training courses, changes to training following the introduction of TG20:13, information and dates on courses available, a list of approved training providers, or to find out more about CISRS, please visit www.cisrs.org.uk or email enquiries@cisrs.org.uk. Principal contractors are increasingly stipulating only NASC Member companies to carry out their scaffolding and access contracts on construction sites across the UK. In two out of their three regions in the UK, major UK contractor Wates Living Space are specifying the use of NASC member companies only for their access and scaffolding requirements. This trend is being reflected across the the UK by most principal contractors and major construction companies – to guarantee that scaffolding best practice is being adopted on their sites. And many of these large construction brands are also joining the NASC as information members, including Wates Living Space. 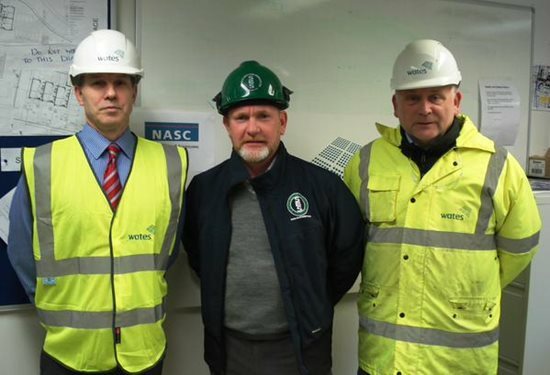 The Wates Living Space Regional Director behind this decision is Regional Operations Director, Tom Langley, who says: “Wates Living Space are delighted to become information members of the NASC – as the national body for setting scaffolding industry standards in the UK. 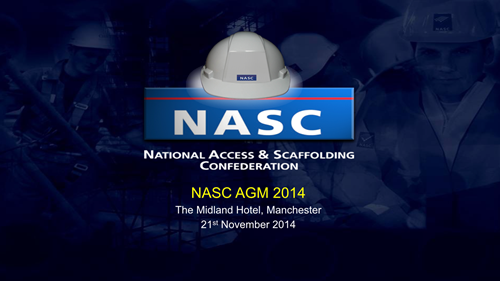 NASC President (and Chairman of Scaffold Erection Services Ltd), Kevin Ward said: “I am delighted that when it comes to potentially hazardous access and scaffolding activities, Wates Living Space have identified that the surest way to provide a safe working environment for all affected parties on their sites (where industry specific best practice will be the norm) is to join the ever expanding list of blue chip organisations that stipulate the use of NASC regulated scaffolding companies only on their sites across the UK. 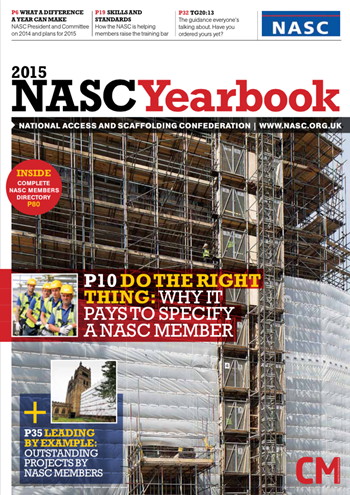 For details about becoming an NASC full member or information member with the scaffolding industry trade body – the NASC (National Access and Scaffolding Confederation) – and to find out more about TG20:13 and other technical and safety guidance, please visit www.nasc.org.uk or email: enquiries@nasc.org.uk. 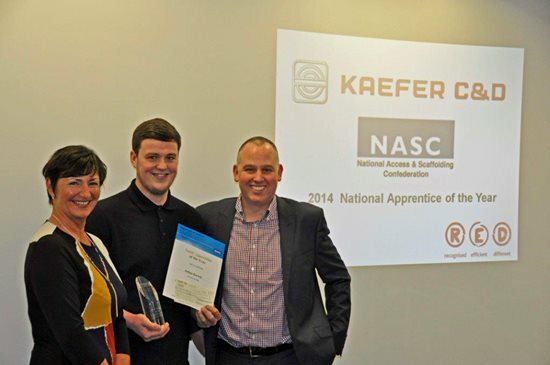 The inaugural NASC Apprentice of the Year Award winner – Josh Kerwin of Kaefer C&D Ltd – was presented with his trophy, certificate and £500 cash prize this week by NASC Training Director, Dave Mosley and Diane Wood, award scheme judge and Specialist Account Co-ordinator for CITB (Construction Industry Training Board). 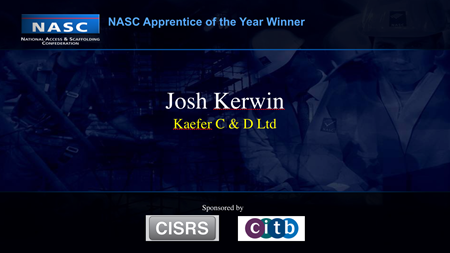 Josh said: “I’m very pleased to win this new award from the NASC and am very grateful to KAEFER for supporting me through the scaffolding apprentice programme. It’s been an incredibly positive experience and I would recommend the Scaffolding apprenticeship route to anyone looking to get qualified within the scaffolding sector. The facilities at the Bircham Newton training centre were very good, I enjoyed the course and the instructors were excellent. “It was really interesting to meet up with other lads on the course from all over the country with different levels of scaffolding experience. Everyone got on well and the instructors would ask more experienced lads to work with those who were finding it harder going. Richard Llewellyn, Midlands Area Operations Manager added: “Two years ago, KAEFER C&D decided to go down the apprenticeship route, as we became aware we had an ageing workforce and wanted to bring in some new blood. We could not be more pleased with the results, with young lads like Josh Kerwin far exceeding our expectations. As a result of the success of the apprenticeship scheme to date we have taken on a further 15 new apprenticeships across the UK. The successful candidate needed to be conscientious, show a willingness to learn, and develop skills and go above and beyond the call of duty whilst working their way through the qualification. Award scheme judge Diane Wood wanted to see evidence of someone who through hard work, personal development and a commitment to the industry would be viewed as a shining example to others looking to enter the scaffolding sector. She said: “Josh originally started as a yard lad in 2011. He then applied for a labourer’s job and worked for a year labouring before moving into the Scaffold Division and starting an apprenticeship. He has not only overcome his own personal challenges of working away from home while so young, but he has also helped others – in particular another team member who was finding it difficult attending college and being away from home. Joshua’s support enabled this person to continue at college. Dave Mosley, NASC Director of Training and CISRS Scheme Manager said: “Congratulations to both Josh and Kaefer C&D on their achievement. The Scaffolding sector is not always given the credit it deserves for the level of commitment that is required on the parts of both the apprentice and their employer to complete the CISRS scaffolding training programme. 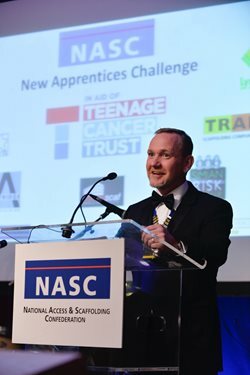 The competition for next year’s award should be particularly strong, thanks to the NASC President’s New Apprenticeship Challenge, which has generated 240+ new scaffolding apprenticeships since November 2013. 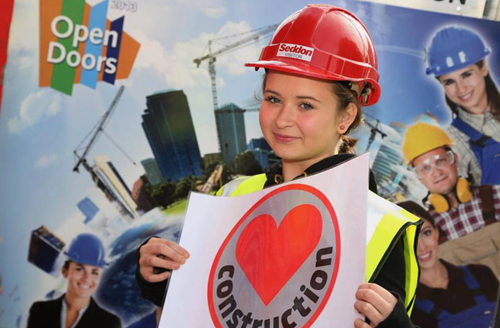 It’s all very positive for the industry, highlighting that the scaffolding sector is leading the way in apprentice training. At the presentation, Mr Mosley and Mrs Wood also gave a special mention to the two runners-up for the 2014 award, Dean Fry of Chris Sedgeman Scaffolding Ltd and Matt Wernham of Connect Scaffolding Ltd, both of whom will also receive a trophy in recognition of their efforts whilst working towards the achievement of their apprenticeships. 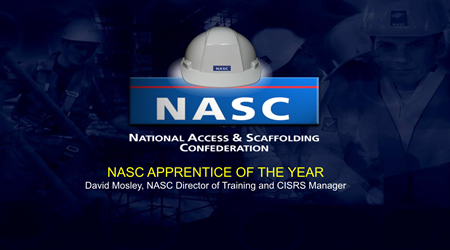 Those wishing to enter the NASC Apprentice of the Year 2015 Award should go to the CISRS section in the member’s area on the NASC website. Details will be available from September.